We arrived at the Pan Pacific in the early afternoon, and were pleased to find that the hotel was only a few blocks away from our school.? Once we had settled into the 5-star hotel, we worked intensely doing last minute research and revisions to our PowerPoint template.? The only events scheduled that night were registration and orientation, so we had plenty of time to ourselves to work and stock up on food and water for the competition (everything at the hotel was expensive!). This was a day full of listening to presentations and panellists.? The opening keynote was from Mr. Matthew Quinlan, Managing Director and Co-Head of Global Mining at CIBC World Markets.? The morning progressed into an overview of investment banking with presentations from representatives from Macquarie Capital, RBC Capital Markets, CIBC World Markets, and Bank of America Merrill Lynch.? After a brief lunch run to get dim sum, we proceeded to attend four sets of panels that varied from sales/trading to corporate finance.? To finish off the night, there was a career fair and a networking event put on by RBC. This was the big day. The competition.? We woke up bright and early for breakfast at 6:00am, and began the case at 6:30.? The case was on gold mining, and it was our duty to establish the terms of an M&A transaction.? It involved financial models, comparables, precedent transactions, and qualitative analysis.? For a time constraint of roughly six hours, there was certainly a lot on our plate.? We managed to complete the case to the best of our ability, and were then cabbed to National Bank Financial, where we made a seven-minute presentation followed by a seven-minute Q&A to a group of investment bankers.? Unfortunately, we were informed that we did not finish at the top in our division of five, so we missed out on the opportunity to present at the Gala Dinner.? 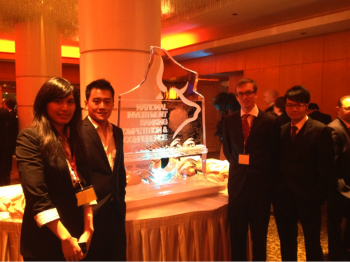 The team that advanced was from the University of Toronto and they went on to win the competition with a very polished presentation.? After the competition, the Chairman of the Board for Goldcorp, Mr. Ian Telfer, made a humorous speech about his thoughts about the competition and offered some general advice.? To wrap up the night, there was an exclusive party at a club called Barcelona, with complimentary limousine service.? 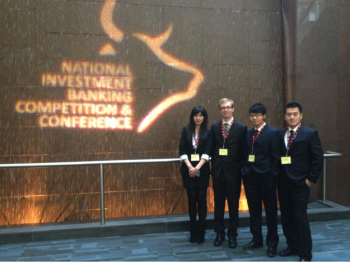 This competition gave us a real insight on the life of investment bankers and was a great learning experience. Our team would like to thank Derek Yee, Ashkan ZiabakhshDeylami, Milton-Andres Bernal, and the current students in our program for helping us prepare with all of our practice rounds. Next story What. A. Weekend.